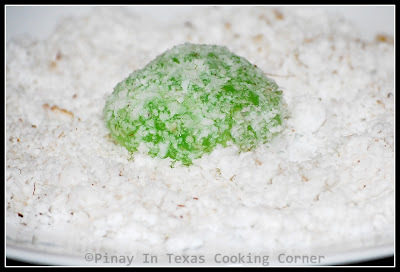 Pichi-pichi is a Filipino dessert made from grated cassava (kamoteng kahoy), sugar and water, and then coated with grated coconut for additional flavor. I don't know where the name came from, but it's one kakanin (Filipino native sweet delicacies) I love! It is very easy to make and is really so affordable that's why it is very popular among Filipinos especially those in Metro Manila and in the Tagalog Region. 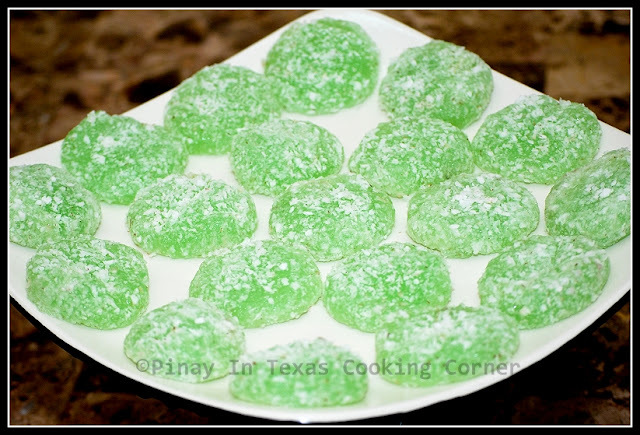 The traditional pichi-pichi is flavored with pandan and is usually light yellow in color. 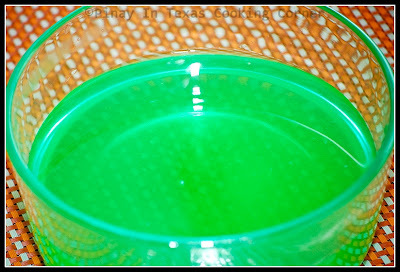 Nowadays, other flavoring and colors of pichi-pichi are available. There are even versions with cheese toppings. But I want to stick to the original version. My mother cooked this so often. She used fresh cassava which she boils first before grating, and I remember her picking pandan leaves from our backyard to use as flavoring. 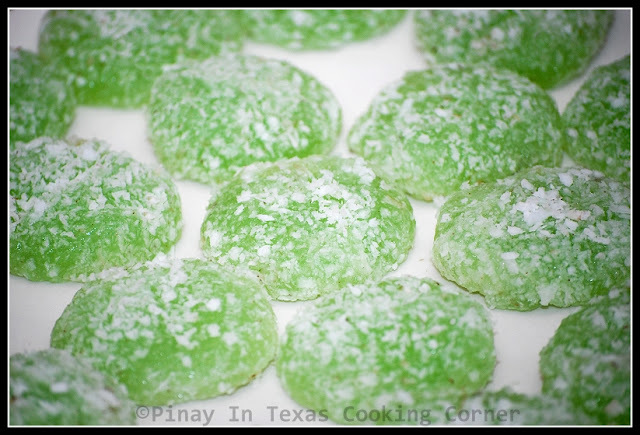 I don't have fresh cassava and pandan leaves here in Texas, so I have to content myself with store-bought frozen grated cassava and bottled pandan essence everytime I make pichi-pichi. Though it tastes almost the same, I still prefer using fresh ingredients if possible. My pichi-pichi turned green this time though I didn't use any food color. It's just from the pandan essence I used. It is really good though...so soft and chewy! Try it...it's such a good dessert, but can be served for mid-afternoon snack too! * I'm sharing this on What's Cooking Wednesday, What's on the Menu Wednesday, Real Food Wednesday, Miz Helen's Country Cottage's Full Plate Thursday and It's a Keeper Thursday. Prep Time: ~5 mins Cook Time: ~45 mins Yield: ~25 pcs. 1. 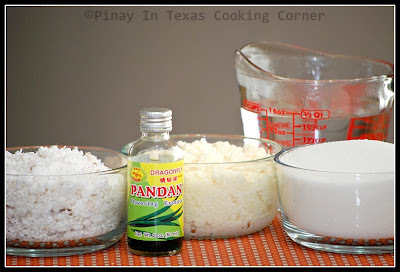 In a large bowl, add 2 tsp pandan essence in water, then dissolve sugar in it. 2. Add the cassava. Mix well. 3. Pour into a mold that fits your steamer (I used a 7-inch round pyrex dish). 4. Steam for 45 minutes or until the mixture becomes translucent. 5. While still warm, scoop out the cooked mixture with ice cream scoop or measuring spoon and roll into grated coconut. 6. Arrange on a serving plate. Serve as snack or dessert! Looks delicious, I love the color! Pandan fragrant and the outcome of the dessert is so yummy Tina but am just wondering what is kassava? have not heard of this before. I think its grated coconut? am I right, mean the cassava? Hi Nava! Cassava is also called yuca or manioc. I'm not sure if it's ubi kayu in Malaysia. I miss those! I never tried making pichi-pichi even frozen one is not available here in Taipei. Hopefully, I can find fresh cassava. Looks nummy, love your recipes! I look forward to checking more out! Stopping by From Wordless Wednesday, love the picture! What a beautiful green color (and without any artificial coloring). Lovely photo. They look so cute Tina :) I never heard of these tiny bites before . This looks like both the Japanese Mochi and the Malay dessert, Oneh Oneh (coated and filled with grated coconut too). The color is awesome! Beautiful little sweet snacks especially with a cup of tea! I have never had these but they look really good! I wish I could just try one right now ;). Pichi-Pichi looks so good. I would love to try it. You are introducing us to so many wonderful dishes to try. Thank you so much for sharing with Full Plate Thursday and hope to see you next week! Hi! Dito po ako sa houston. 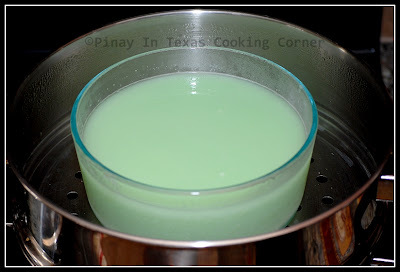 Saan po kayo nakabili ng cassav and pandan extract? 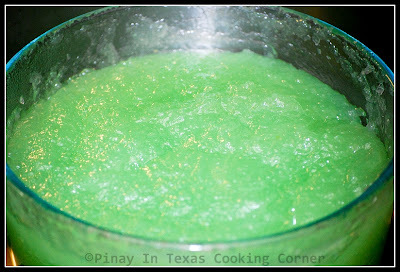 I'm here in DFW area and I usually get pandan extract and frozen cassava from the nearby asian grocery stores here. There's HMart and 99 Ranch Market in Houston. I'm sure may mabibili ka don. Hi Tina. I live here in Dallas. I'm just wondering where can i buy fresh grated coconut. I saw some frozen stuff here but not fresh. What do you use?